"Mother (マザー Mazā), sometimes referred to as "EarthBound Zero", is a console role-playing game (RPG) developed by Ape, Inc., Pax Softnica and Nintendo Tokyo R&D Products and published by Nintendo for the Family Computer (Famicom) video game console. It was designed and directed by Shigesato Itoi and produced by Shigeru Miyamoto, with music by Keiichi Suzuki and Hirokazu Tanaka. It is the first game in the Mother video game series (otherwise known as the EarthBound series), and was never released outside of Japan. In 2003, the game was re-released in a compilation with its sequel as Mother 1+2. The game's taglines are "No crying until the end" and "Guaranteed masterpiece". Mother tells the story of a psychic boy from Mother's Day, a fictional town. The boy, whose default name is Ninten sets out on a journey to discover the cause of the mysterious phenomenon that occurred in his home one day. As the story develops, he meets friends along the way and they fight their way to the source of all their troubles. At the time, most RPGs took place in similar overall settings; worlds modeled after the Middle Ages and focusing on swords and magic, with very few exceptions (among them Square's Tom Sawyer). Mother takes place during a more modern time (1980's) in the United States and has equipment like baseball bats instead of swords and psychic powers (PSI) instead of magic. It was scheduled to be released in North America as Earth Bound in the Fall of 1991, but marketing delayed and eventually removed the game from the release schedule, putting it on indefinite hold. The game was again considered for release in 1994, shortly before the release of its sequel, Mother 2: Gyiyg no Gyakushū. 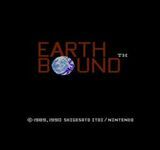 However, it was decided to pass on the release of Earth Bound and to localize Mother 2 under the title EarthBound. A copy of the game created during the consideration was later sold on the Internet, and the ROM data was extracted and circulated under the title EarthBound Zero on January 15th, 1998." Source: Wikipedia, "Mother_(video_game)," available under the CC-BY-SA License.